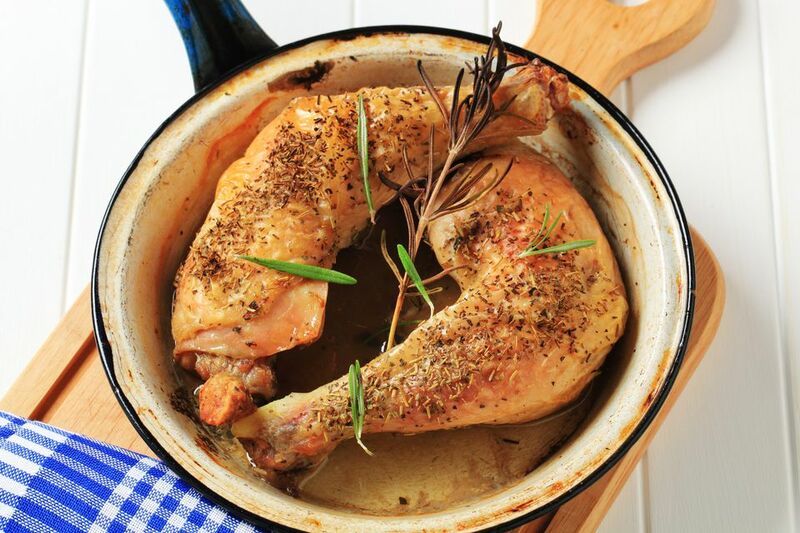 Serve this easy and tangy baked chicken recipe for Shabbat during Passover. Just mix together the marinade ingredients, which are economical, flexible and kosher for Passover. Let the chicken marinate for a few hours or overnight. And bake. The resulting chicken is so delicious that your Sabbath guests are likely to ask for the recipe. Arrange chicken in a single layer in a glass baking dish. In a small bowl, whisk together cola, ketchup, apricot jam, onion, garlic, salt, pepper, and ginger to form the marinade. Pour the marinade over the chicken. Cover. Refrigerate for at least 2 hours or overnight. When ready to cook, heat the oven to 375 F/190 C.
Bake, covered, for 1 hour, basting after 30 minutes. Remove the foil. Bake uncovered for another 20 to 30 minutes, until the chicken is browned and cooked through. If you like, cut peeled or unpeeled potatoes into quarters and bake with the chicken.